Now is the time: will people with disabilities truly be at the centre of DFID’s new strategy? Last year was doubtlessly an ambitious one for the Department for International Development’s (DFID) work on disability. April 2018 saw significant efforts to influence the Commonwealth Heads of Government (CHOGM) meeting to commit to disability inclusion; and few of us in the disability and development sector are likely to forget the Olympian efforts to host the first Global Disability Summit, in one of the hottest Julys on record, which resulted in over 170 sets of commitments to people with disabilities. By the end of 2018, and within deadline, DFID’s disability updated framework was unveiled in the form of a strategy and delivery plan – Framework 2.0, if you like. The creation of an accompanying delivery plan with timescales, plus a set of minimum disability inclusion business standards for all DFID units, are important in ensuring the Strategy is a practical roadmap to greater inclusion and not just well intentioned word-smithery. One area of concern, however, is to what extent people with disabilities from the global South and their representative organisations have a leading role in this agenda. DFID reported significant engagement with country offices on the strategy, and consultation with DPOs; although if the consultation timescale was similar to that offered to INGOs, it would almost certainly not have yielded optimum participation. Of concern is also the minimum standards strand on engagement and empowerment of people with disabilities, which describes a high level of achievement as ‘active support by DFID to build strong networks of Disabled Peoples Organisations’. Whilst we welcome any proposal for DFID to be supportive of DPOs, this aspiration – at least in its expression - misses the point: DPOs, and their networks, are self-organising, self-representing groups, not to be engineered by government. CBM has learnt from years of our own practice that where we don’t properly engage with DPOs throughout the development of our programmes, the programme is less likely to succeed in embedding lasting inclusion. Ensure that the agenda is set and led by DPOs and is in line with CRPD. Don’t try to establish DPOs or umbrella networks if there is no impetus for it coming from the ground. Be “on tap” not “on top”. Support the inclusion of underrepresented voices in the movement. Avoid getting involved in DPO politics. Engage with DPOs in a similar way to other stakeholder groups but with a recognition that support might be necessary to enable participate on an equal basis with others. 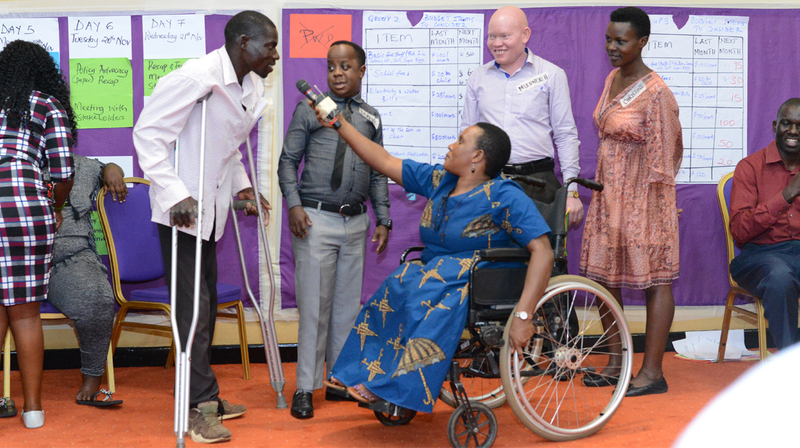 By learning from these lessons, and ensuring more intentionally that people with disabilities are engaged, consulted and listened to at all levels of decision-making, DFID is much more likely to fulfil its vision of a world where no-one is left behind. The Parliamentary International Development Committee is running an inquiry into DFID’s work on disability until 22nd February. CBM UK is submitting a response.